Verifying all GlideinWMS services are communicating. One mean of verifying that all the GlideinWMS services are commnunicating correctly is to perform the following on the User Pool (Collector).
. 1.The DaemonMaster, Negotiator and Collector types indicate the User Pool services are running. 2.The number of Scheduler types should equal the number of schedds you specified for the Submit service. 3.The glideresource indicates the VO Frontend is talking to the WMS Pool/Factory and the User Pool. NOTE: You do require at least one entry point in the Factory for this to show. One exception is the communcation between the Frontend and the User Submit/Schedd services. This is one area of failure this check does not cover. This section contains tips and troubles relevant to all phases of a job's execution. Also see the user tutorials with example job submissions for VO Frontends. Many GlideinWMS issues are caused by authentication. Make sure that your proxy and certificate are correct. Each process needs a proxy/cert that is owned by that user. Note that /tmp/x509up_u<UID> is the typical location for x509/kerberos proxy certificates, but use the proper location if the place of your server certificate varies. Always source the correct condor.sh before running any commands. Many problems are caused are by using the wrong path/environment, (for instance, sourcing the User Pool condor.sh then running WMS Pool Collector commands). Run "which condor_q" to see if your path is correct. Note: If you are using OSG Client installed via tarball and source the setup.sh (e.g. for voms-proxy-init), this may change your path/environment, and you may need to run condor.sh again. This is a failure to communicate with the WMS Pool (Collector) and Factory services. [2011-09-21T13:54:04-05:00 3859] WARNING: Failed to talk to factory_pool cms-xen21.fnal.gov:9618. See debug log for more details. CEDAR:6001:Failed to connect to <131.225.206.78:9618> Error: Couldn't contact the condor_collector on cms-xen21.fnal.gov (<131.225.206.78:9618>). Verify the WMS Pool is running. Verify the IP/NODE is correct for the WMS Pool. If it is incorrect, the frontend.xml should be corrected and a Frontend reconfig executed. If you have access to the WMS Pool, check the ALLOW/DENY configuration in its condor_config. Another reason for failure is a GSI authentication error (aka permission denied) error occuring on the WMS Collector. If you have access to the Condor log files for that service, check the MasterLog and CollectorLog for authentication errors. The VOFrontend's proxy (proxy_DN) must be in the CONDOR_LOCATION/certs/condor_mapfile of the WMS Collectors to allow classads to be published. This is a failure to communicate with the User Pool Collector service. This does not affect the ability to submit and run jobs. [2011-09-20T13:51:25-05:00 4619] WARNING: Failed to talk to collector. See debug log for more details. [2011-09-20T13:51:25-05:00 2994] WARNING: Exception in jobs. See debug log for more details. Verify the User Pool is running. Verify the IP/NODE is correct for the User Pool. If you have access to the User Pool, check the ALLOW/DENY configuration in its condor_config. Another reason for failure is a GSI authentication error (aka permission denied) error occuring on the User Pool. If you have access to the HTCondor log files for that service, check the MasterLog and CollectorLog for authentication errors. The VOFrontend's proxy (proxy_DN) must be in the CONDOR_LOCATION/certs/condor_mapfile, of both collectors, to allow classads to be published. If you encounter errors submitting your job using condor_submit, the error messages printed on the screen will be useful in identifying potential problems. Occasionally, you can additional information in the condor schedd logs. Always make sure that you have sourced the condor.sh and that the path and environment is correct. If you are installing all services on one machine (not recommended but sometimes useful for testing) make sure that the user collector and wms collector are on two different ports (such as 9618 and 8618). You can do "ps -ef" to see if the processes are started (should be multiple condor_masters, condor_schedds and condor_procd for each machine). Make sure they are running as the proper users (user schedd should be probably be run as root. wms collector should be run as root if you want privsep). Also refer to the Collector install for verification steps. Symptoms:User job stays idle and there are no glideins submitted that correspond to your job. 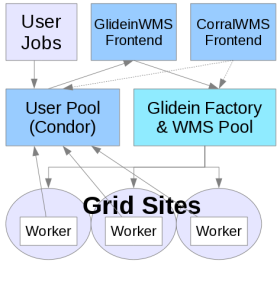 This step involves the interaction of the VO Frontend, the WMS Factory and the Glideins. Hence, there are two separate facilities to see why no glideins are being created. See the Factory Troubleshooting page if none of suggestions below help. Symptoms: User job stays idle and there is no information in the Frontend logs about glideins required to run your job. Check if the VO Frontend is running. If not start it. Check for error messages in logs located in GLIDEINWMS_VOFRONTEND_HOME/log. Assuming that you have named Frontend main group as “main”, check the log files in GLIDEINWMS_VOFRONTEND_HOME/group_main/log. You should notice something like above in the logs corresponding to your job. If the Frontend does not identify any entry that can run your job, then either the the desired entry is not configured in the glidein Factory or the requirements you have expressed in your jobs are not correct. Also, check the security classad to make sure the proxy/cert for the Frontend is correct. It should be chmod 600 and owned by the Frontend user. The symptoms of this issue are a break in communication between the VO Frontend and the Factory. In this case, the problem may also be a problem with the Factory. See the Factory Troubleshooting guide for more details. [2010-09-29T09:07:24-05:00 26824] WARNING: Found an untrusted Factory ress_ITB_GRATIA_TEST_2@v2_4_3@factory_service at cms-xen21.fnal.gov; ignoring. The Frontend config's security element security_name attribute does not match the Factory config's Frontend element name attribute. If the pages are not reachable check that your web server is running and that no firewall (host or network) is blocking those pages. GlideinWMS comes with a set of administrative tools that you can use when troubleshooting problems. fetch_glidein_log - This tool will fetch the log from a glidein. It is a wrapper around condor_fetchlog. glidein_off - This tool will turn off one or more glideins. It is a wrapper around condor_off. that simply sets the environment so that it matches the one used by the Frontend daemons. You can then use all HTCondor commands directly, to both the glideins and the Factories. All tools require access to the Frontend group's work area in order to work. The top level work area can be set either with a -d option, or through the $FE_WORK_DIR environment variable. The group name can be set either with a -g option, or theough the $FE_GROUP_NAME environemtn variable. remove_requested_glideins - This tool will request the removal of glideins requested by the Frontend. This comes handy when/if you find out that you had major configuration problem in the previous Frontend configuration. By default, a reconfig will only request glideins of new type, but will not remove any old ones. idle - Only remove glideins that have not started yet (the default). all - All glideins, including those currently running. This tool queries the Factory and Frontend classads in the wms collector and generates glidein_startup.sh command along with arguments. This is useful from a VO or a site perceptive for debugging purposes to manually launch a glidein and have the HTCondor Startd report to the VO collector. Although all the required information is derieved from the Factory and Frontend classads, user still needs to set the X509_USER_PROXY environment variable. glidein_startup.sh uses this proxy for the condor daemons to talk to the VO collector. manual_glidein_startup --wms-collector=fermicloud145.fnal.gov:8618 --client-name=Frontend-master-v1_0.main --req-name=TEST_SITE_2@v1_0@GlideinFactory-master --cmd-out-file=/tmp/glidein_startup_wrapper --override-args="-proxy http://httpproxy.mydomain -v fast"